One sees not through the eyes but with the help of them, where information is transffired through the optic nerve, chiasmus, optic tracts in the certain areas of the occipital lobes of the cerebral cortex, which form the picture of the outside world that we see. All of these organs make up our visual analyzer or visual system. Two eyes availability allows to make our vision stereoscopic (that is, to form three-dimensional image). The right side of retina of the each eye passes through the optic nerve, "right side" of the image to the right side of the brain, acts like the left side of the retina. Then two parts of the image - right and left - are connected by the brain together. Since each eye sees "its own" image, at the violation of the joint motion of the right and left eyes the binocular vision can be frustrated. Simply saying, you will experience double vision in your eyes or you may simultaneously see two different pictures. Cornea - a transparent membrane covering the front of the eye. It has no blood vessels, it has a great refractive power. It is included in the optical system of the eye. The cornea borders with an opaque outer shell of the eye - sclera. Anterior chamber of eye - the space between the cornea and iris. It is full of intraocular fluid. Iris - in shape like a circle with a hole inside (the pupil). The iris consists of muscles, at the reduction and relaxation of witch they change size. It belongs to the choroid. Iris is responsible for eye color (if it is grey - there's little pigment cells, if it's brown - a lot). It performs the same function as the aperture in the camera, adjusting light. Pupil - a hole in the iris. Its size is usually being dependent on the level of illumination. The more light, the smaller pupil. Crystalline lens - "Natural lens" of the eye. It is transparent, elastic - can change its shape, almost instantaneously, "putting the focus" due to what a person sees well either near or far. It is located in the capsule and is being hold by the ciliary band. The lens, like the cornea, enters the optical system of the eye. Vitreous body - gelatinous transparent substance that is located in the back of the eye. Vitreous body maintains the shape of the eyeball and is involved in intraocular metabolism. It is also included in the optical system of the eye. Retina - consists of the photoreceptors (which are sensitive to light) and nerve cells. Cell receptors that are located in the retina can be divided into two types: rods and cones. In these cells, producing the enzyme “rhodopsin”, light energy (photons) converts into electrical energy of the nervous tissue, i.e., photochemical reaction. Rods have a high sensitivity, allow you to see in low light and they are responsible for peripheral vision. Cones, on the contrary, require more light for its work but they allow you to see fine details (are responsible for the central vision), make it possible to distinguish colors. The greatest concentration of cones is in the fovea (macula) that is responsible for the highest visual acuity. The retina is adjacent to the choroid but not tightly in many areas. Right here it has a trend to flake off at the various diseases of the retina. Sclera - opaque outer shell of the eyeball that passes from the front part of the eyeball into a clear cornea. Six eye muscles are attached to the sclera. It has a small number of nerve endings and blood vessels. Choroid - lines the posterior sclera to the retina with which it is closely linked. Choroid is responsible for blood supply to the intraocular structures. 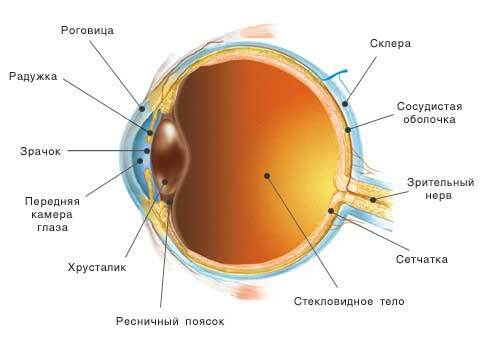 At the diseases of the retina the pathological process is very often involved in. The choroid has no nerve endings, so while its disease there aren’t any pains that are usually signaling about malfunction. Visual nerve – with the help of the optic nerve signals are being transmitted from the nerve endings to the brain.